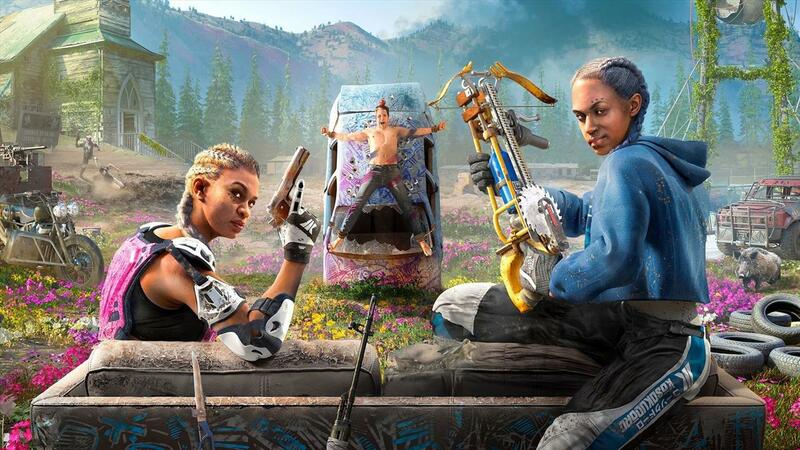 Let’s get one question out of the way: Should you play Far Cry 5 before you play Far Cry New Dawn? But to be honest: Yes. 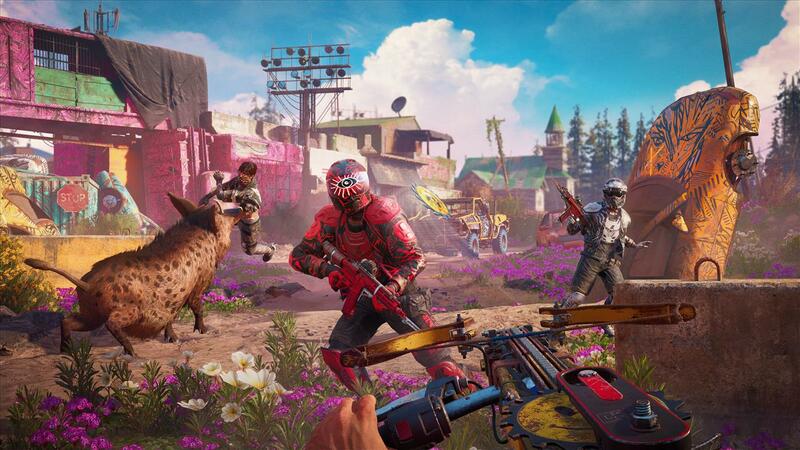 Far Cry New Dawn is the standalone sequel to Far Cry 5. 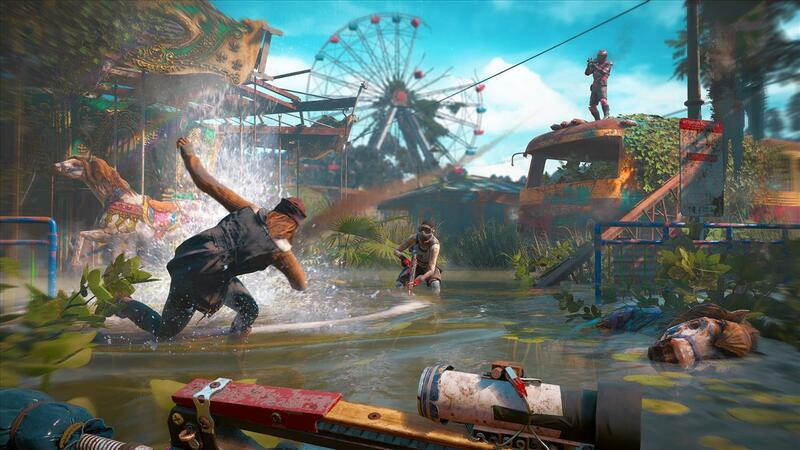 That means you don’t have to play 2018’s open-world Montana actioner before you play 2019’s post-apocalyptic open-world Montana actioner. As far as video game storefronts are concerned, neither one is dependent on having purchased the other. 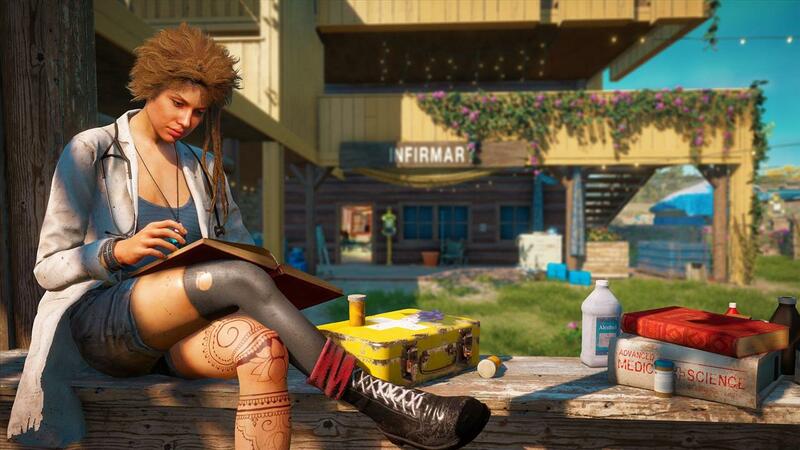 But if you’re playing New Dawn without the previous and prior experience of Far Cry 5, then you’re missing out on a lot of stuff. I know I am. Even from my first impressions, I could tell. 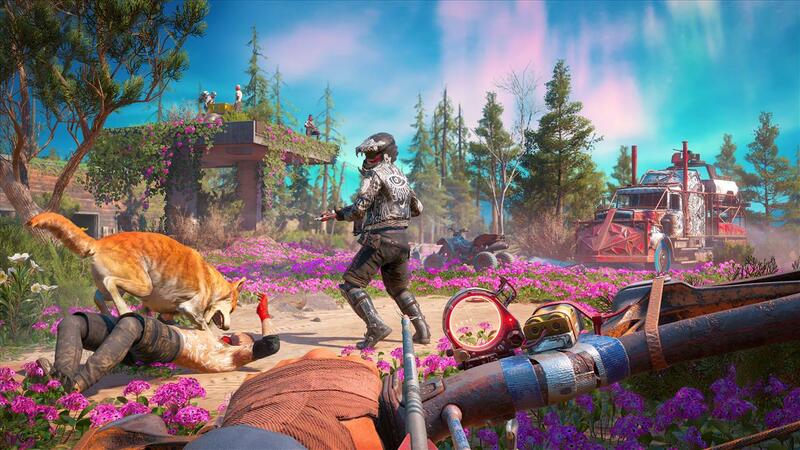 Sure, the fantastic fuchsia blooms that blanket the woodland hills are a lovely backdrop to the explosive action of the Far Cry series. Yes, the blonde and braided twins, the leaders of the Highwaymen, form a decent arch-nemesis. 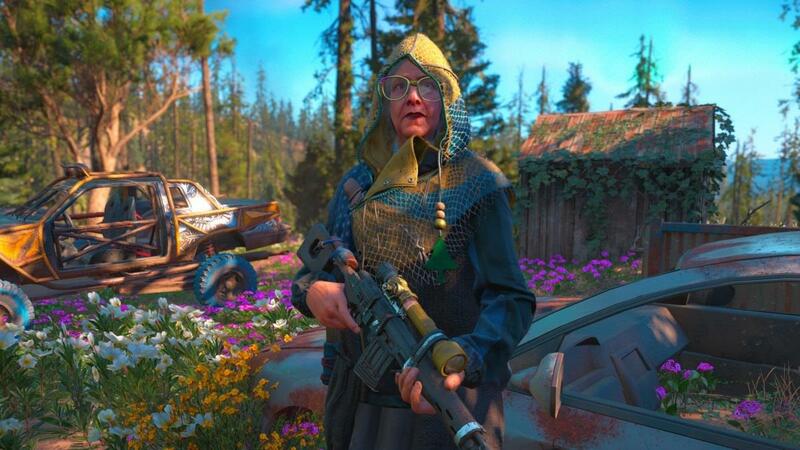 And, okay, it doesn’t take a lot of literary foreknowledge of Far Cry 5’s events to be able to pick up an AK, hop into a coupe, and ride across dirt roads to blow up the next enemy compound. You can do all those things without knowing what this ruined bridge once connected, or that these two Porta Potties now stand where a cult preacher once trained elite soldiers. Also, how else are you supposed to know what all this talk of "peggies" is about, or what took place in the F.A.N.G. Center? New Dawn will clue you in a little bit with scattered notes (always scattered notes), the occasional tape recorder, and a random quip or two from other characters. 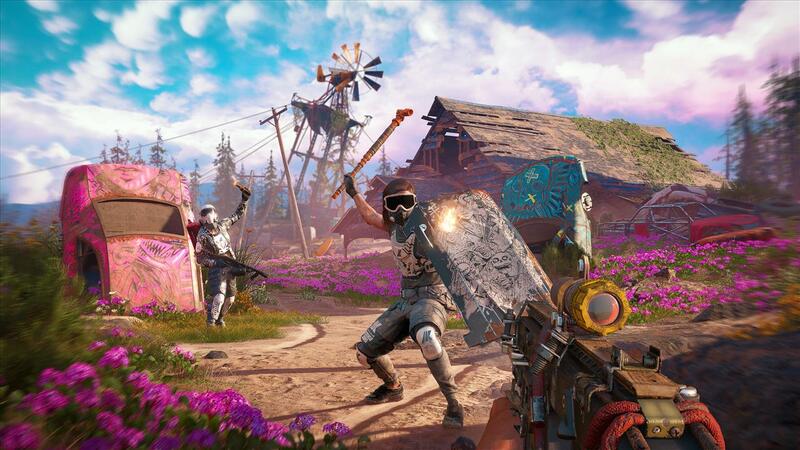 In other words, if you’ve played Far Cry 5, then you know there’s an old world worth rebuilding. 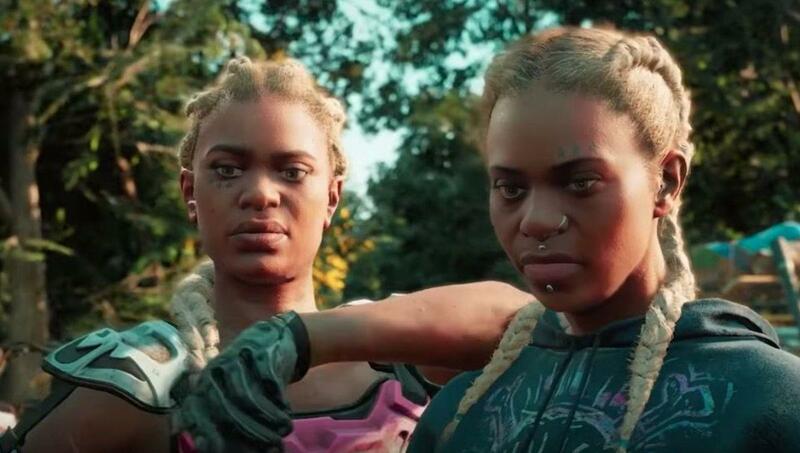 If you haven’t played Far Cry 5, then you, like the twins, your enemies, know nothing but the fallout. I don’t think it’s the best frame of mind to be in. But I’ll admit it’s a legitimate frame of mind to be in. Your character is a member of some security force. You’re one of the good guys, presumably, since the game keeps telling me “Do not kill innocent civilians” whenever they run out into the middle of the road as I’m tearing along at 50 miles per hour down some squirrelly country road. But everybody is looking for a savior. And your lightly customizable male or female looks exactly like the savior the good folks of Prosperity are looking for. New Dawn’s home base, Prosperity, is a cozy pine lodge. Well-kept, too. Not bad for a place that has old water-stained photographs of Hope County on the walls, and a dozen copies of a book called "Your Meat Is Neat" on the shelves. But it’s homely. Traveling across this decayed rendition of Hope County, you’ll collect tanks of ethanol, milk crates of supplies, vehicle shocks, and duct tape. That's the shopping list that will rebuild the future. Ethanol happens to be the magical substance that makes every upgrade on your home base possible, turning that old pine lodge and wooden wall into something more like a Hanging Gardens of Babylon. With lots of stringed lights everywhere. So much idle chatter, though. Everywhere I go in New Dawn, it’s rooms full of people talking to themselves. Or having non sequitur conversations in proximity to one another. That and notes laying around or pinned to walls. Can everybody stop repeating their two or three lines of canned dialogue, please? Trying to refurbish the earth, here. On my first run out to rescue a fellow name Bean, a random encounter with bad guys (you’ll have hundreds of them) went horribly wrong. I was on a motorcycle with my first companion in a sidecar, being chased down by some kind of Mad Max truck and a four-wheeler. The four-wheeler caught up to us on a bridge. It ran up the side railing on my right, effectively running over and killing my companion. I thought she was a rather important member of the good guy family. She’d recognized me from the train. She’d led me to the Prosperity settlement. She’d handed me my first change of fresh clothing. Now she’s dead. But not to worry. Companions can be revived back at base. No one says a word about them being dead for a little bit. They're fine now. I thought that was a freak accident, but the life expectancy of all my companions is pretty low. Theoretically, companions can revive you if you go down in battle, or fall off a cliff or whatever, but more often than not, if I was going down in a fight, they already went down minutes ago. Never had a companion I didn’t have to revive after any decently sized firefight. It was easier to just leave them at home. Except for the dog. I’m not even pretending to be a dog lover when I say that. Just from a mechanical standpoint, the dog, Timber, a "much doge, such wow" Akita breed, is far more utilitarian as a companion than the rest of the roster. Timber marks enemies and supplies and can pin an enemy down while tearing them to pieces. Who's a good boy? 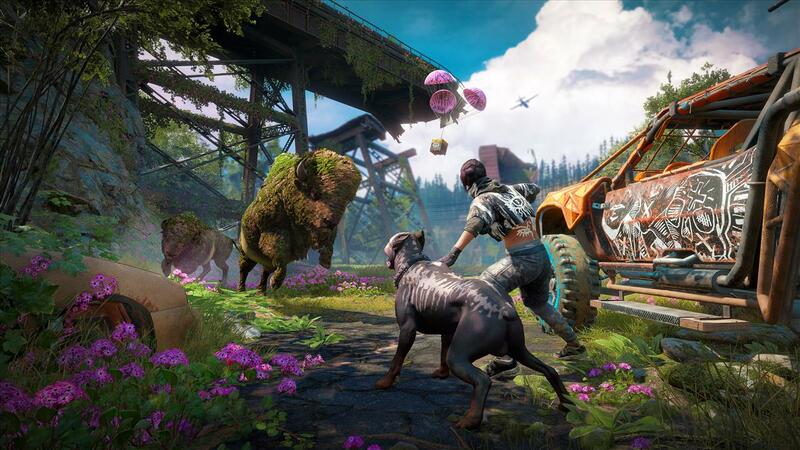 The open-world nature of New Dawn devalues all life. The systems interact with each other on exclusively violent terms. The one person operating a barcade up in the hills was chased down and killed by a wolf as soon as I got there. That was it. Barcade done. Or like the time I wandered up into the hills and saw a sign warning me about a big wolf in the area. As soon as it appeared on my radar, a high-tier bad guy was standing in front of it, just cocking and unloading shotgun shells at the thing until it died. I barely had time to arrive to finish off the Highwayman with a stick of dynamite and an arrow to the face mask. New Dawn becomes tedious when it fails to strike a middle ground with its combat. It takes multiple clips of sustained automatic gunfire to bring down a bullet-sponge enemy, yet one shotgun blast can end everything for you. At least in the beginning. Or, in your vehicle, accidentally bumping into yet another four-wheeler wearing explosive tanks on their back to, once again, go boom, and you’re done. 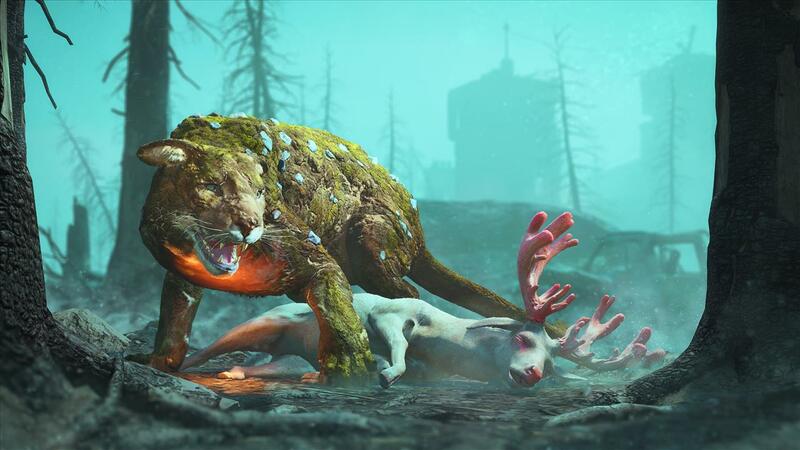 The Far Cry series tries to give you the most forms of locomotion possible. Trucks, bikes, tractors, quads, parachutes, wing suits, helicopters, and grappling hooks. But it gets wacky. The grappling hook is a ton of fun to use, but it's only usable in specifically marked instances. Plus, using it is one of the ways I've gotten trapped in the world's geometry. The "very vintage" Mustang is a great car to drive around, but I have been killed by running over other people in that thing. And I've died a few times when my parachute failed to deploy off tall cliff sides. It happens. But like I said, life is cheap in Hope County. Which also means it’s not a big deal to respawn pretty close to wherever you left off. This is a land where it’s a perfectly normal day to watch a bear kill three of your allies, then see a mountain lion kill that bear, then for a supply drop to land nearby, have a bad guy with an explosive tank on their back go up in a ball of flame when you shoot them point blank, then you have to pop some meds to regain all your life back, then give your dog a reviving pat on the neck since he was caught in the blast radius, then spend three perk points to acquire the Repair Torch so you can get an exploded truck back into working order, then just move on down the road to a trap music soundtrack. Speaking of soundtrack, the radio is off the hook. It's not as inspired as a Grand Theft Auto soundtrack. On the other hand, hearing Killer Mike and Die Antwoord coming hard on one station, while '60 surf rock and folk soothe on the other, is fairly inspired. The main story throws you into increasingly dangerous encounters with the Highwaymen’s twins. Amidst the crafting material collect-a-thon, you’ll cross paths with another familiar face, too. Meaning, you haven’t seen the last of Joseph Seed, yet another character I have no prior experience encountering because I skipped Far Cry 5. Yes, that’s my fault for not having played the previous game. 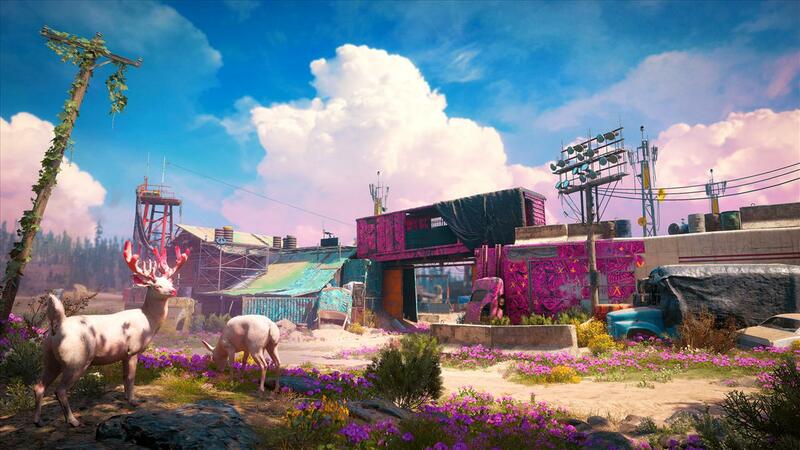 But exploring this overgrown floral post-apocalypse has been decent, if only in the way that exploring a brutalist post-apocalyptic world is hampered by its own primal sensibilities. 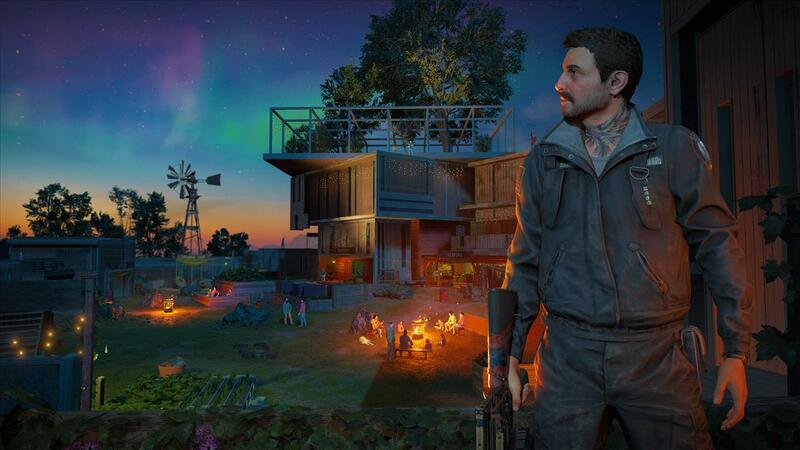 I had the most fun in New Dawn during two states: when I was at my most stealthy and, conversely, my most reckless. 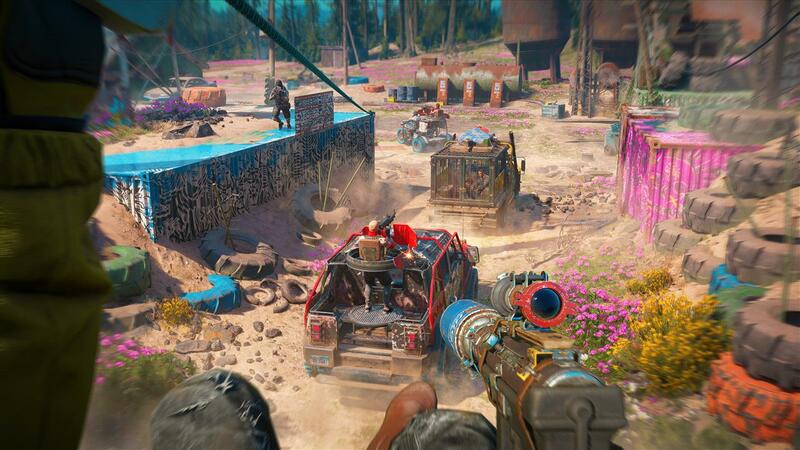 Those are Far Cry’s sweet spots. Either doing one-click takedowns on enemies you sneak up on, or just turning the entire place into a run-and-gun wonderland of destruction. 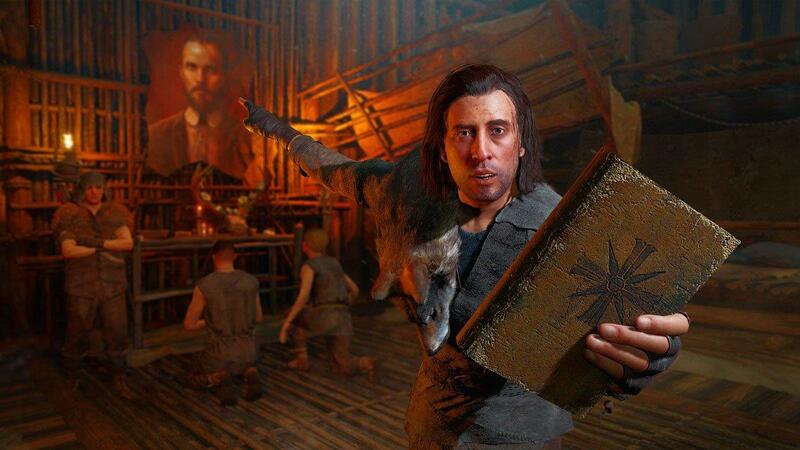 If you play Far Cry in the middle, then it’s a middling experience. But if you embrace New Dawn’s ridiculousness, there’s a fun, casual level of violence to enjoy.